Above photo kindly sent by Geoff Sherman, showing Charles William Woodbridge, circa 1935, who he says married a great aunt of his. I have found mention of another "Star and Garter" dating 1758 and mentioned as being in Great Street. At present I am unsure where Great Street was. The above pub being mentioned as early as 1758 suggests that it could not be this one as previous to this name and by 1847 it was the "Waterman's Arms." However, there is nothing to suggest that pubs cannot change back to their original name. Barry's research states:- This was an outlet of "Gillow and Wareham" which was revealed to me only once. They were brewing prior to 1872. It had previously been the "Waterman's Arms" but between times had been utilised as a private dwelling before opening under this sign. That would have been before 1868. Gillow also owned 49 Clarendon Place and in 1881 would have liked to transfer this licence there. He was prevented from doing so. From the Dover Express and East Kent News, Friday, 24 December, 1869. Mr. Solly, the landlord of a public-house, applied to the Magistrates to be informed whether he was prohibited from having his friends to see him during the prohibited hours on a Sunday. The Magistrates told him they supposed the landlord of a public-house was entitled to receive his friends when he pleased, like other people. Mr. Solly then explained that on the previous day Sergeant Barton had entered his house by a back door and had complained that a friend of his was there in contravention to his license. The Magistrates asked if there was any report against Mr. Solly. Superintendent Coram said there was no report in this instance, although Mr. Solly had been previously convicted against for infringing his license. The Magistrates addressing Mr. Solly, informed him that he had better read his license, which would give him full information on the subject. When a report was made against him, they would deal with it in its merits. From the Dover Express and East Kent Intelligencer, 23 August, 1929. Price 1½d. At the Dover Police Court this morning, before Messrs. W. B. Brett, T. Francis, and G. Golding. 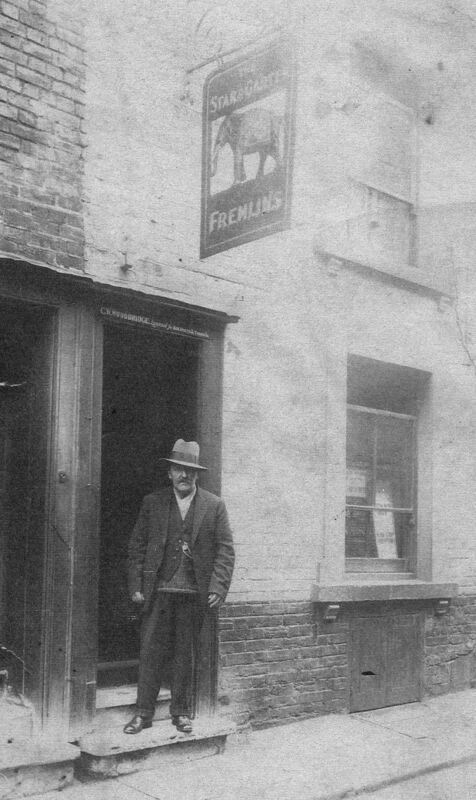 Frederick Edward Parker, landlord of the “Star and Garter,” Trevanion Street, was summoned for supplying intoxicating liquor during prohibited hours. Reginald Brown, now at Southport, Richard King, Trevanion Street, and Horace Dowsey, Cyprus House, Liverpool Street, were summoned for consuming. Parker pleaded guilty and King and Dowsey not guilty. Brown sent a letter. Mr. O'Meary prosecuted, and said that the landlord accounted for the presence of the other men saying they were his friends. P.S. Pay said that at 11.25 p.m. on Friday, July 26th, he was with P.C. Kemp (17) and saw a light burning and heard voices and stopped, listened, and kept observation. He sent P.C. Grant to the rear of the premises. He heard voices saying, “Come on, there is time for one more,” and looking through the letter box he was able to get a good view of the bar inside. He saw Brown in the act of taking a glass of ale from the licensee behind the counter, and at the same time he said, “How much do you want?” he put some money on the counter. Witness said, “Kemp, they are paying for drinks, you have a look.” On looking again he saw brown take some money off the counter and put it in his trousers pocket. He took it to be the change. He saw Parker draw another glass of ale and put it on the counter. He waited and then knocked, and the door was opened by Parker. Brown and King had glasses of old ale and Dowsey a glass of bitter. Witness said to the landlord, “How do you account for these people being in the bar?” he appeared to be to astonished to answer. His lips moved, but no sound came. He told him what he had seen Brown doing, and the defendant said, “There have been no drinks paid for. I paid for the drinks before two o'clock.” Witness pointed out the time, and the defendant said that they were his friends. Turning to Brown, he said, “You are a member of the Concert Party. Are you a friend?” he replied, “I was introduced to the landlord last Sunday, and have been here every night since.” Witness told him what he had seen him doing, and Brown said, “I offered to pay, but the landlord would not take it, and I put it back in my pocket.” King said that he came there at five minutes to ten to do some business, but he did not say what; and Dowsey said he came to see Mr. Parker on business. King came after him and said, “What kind of game do you call this?” Witness said, “Be careful what you say. You had your chance of explanation inside the pub.” King said, “You know the trouble I was in some time ago. Are you going to report this?” Witness replied, “of course I am.” King said he wanted to know who gave him the information and sent him there, and witness said that he would not be so silly as to tell him. King said, “I shall come and see the Chief Constable in the morning,” but so far as witness knew, he did not. King said that he did not leave work at Mr. Hazelden's until after ten o'clock, and never said that he was there at five minutes to ten. Parker said he was sorry it had had happened. He had been there for five years, and had looked after the place, and had never been in trouble before. King and Dowsey both denied that any drinks were paid for; and Brown wrote that he was there as a family guest. The Chairman said that the law must be upheld. Parker was liable to fines amounting to £90, but the Bench had decided to deal leniently with him, and he would be fined £10. The other defendants would be fined £1 each. Mr. Parker asked the Bench for an expression of opinion as to his fitness to continue as licensee. Chief Constable Bond said that he would not oppose renewal. The Chairman said that the Bench were only there to carry out the law, but if Mr. Parker conducted himself properly there would be no opposition. By 1940 it retailed for Fremlin when I presume it would have closed. Permission to remedy war damage was refused in 1947 and if the house was still standing in October 1958, it would have disappeared then. That year, the demolition of all remaining buildings in the area was authorised. The task was performed about May 1960 but Trevanion House itself survived for probably another six years.